PSG host Manchester City in the first leg of their Champions League quarter-final tie at the Parc des Princes on Wednesday night. 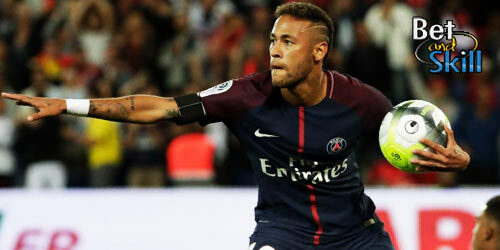 Find here our PSG v MAN CITY betting preview with predictions, betting tips, enhanced odds, probable line-ups, exclusive free bets and no deposit bonuses on the Champions League quarter finals! Paris Sain Germain routed Nice 4-1 on Saturday and won the French league in record time with a 0-9 win at Troyes back on 13 March. They can consequently focus solely on the Champions League. They eliminated defending Premier League champions Chelsea in the knockout round of 16 by winning both legs by the same 2-1 score-line. PSG should have the majority of their big-hitters available for the match, but Marco Verratti remains sidelined with a groin injury. Adrien Rabiot should replace the Italian in central midfield. Javier Pastore is also expected to miss out on the visit of Manchester City because of injury, while Serge Aurier is still being integrated back into the first-team. Lucas Moura and Edinson Cavani are in contention for a starting berth in the attacking trio. Manchester City trail Premier League leaders Leicester City by 15 points in the table and face a real fight to defend their 4th place, the final Champions League qualification spot. This will be the Citizens' first-ever quarter-final in Europe’s elite club competition by winning the away leg 3-1 and drawing the home fixture 0-0 against Dynamo Kyiv in the previous round. City's domestic form is highly unpredictable and could be considered particularly poor away from home. However they have done well in Champions League after winning 3 out of their 4 matches this season. Kevin de Bruyne made a stunning return to first-team action at the weekend after more than two months out injured and should start as offensive midfield along with David Silva and Jesus Navas. Samir Nasri has also played some minutes in the same match but he is expected to sit on the bench. Joe Hart, Raheem Sterling and Vincent Kompany are all sidelined while Yaya Toure is rated as doubtful. The last three Champions League knockout encounters between Ligue 1 and Premier League clubs have all seen the French team eliminate their English counterpart. PSG have won their last 4 Champions League matches scoring at least 2 goals in each game. PSG (4-3-3): Trapp – Maxwell, David Luiz, Thiago Silva, Marquinhos – Matuidi, Motta, Rabiot – Di Maria, Cavani, Ibrahimovic. MANCHESTER CITY (4-2-3-1): Caballero – Zabaleta, Otamendi, Mangala, Clichy – Toure, Fernandinho – David Silva, De Bruyne, Navas – Aguero. Boosted odds! 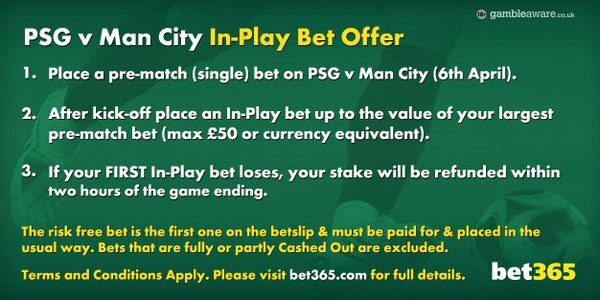 15/1 Manchester City to win the match! Crazy price! 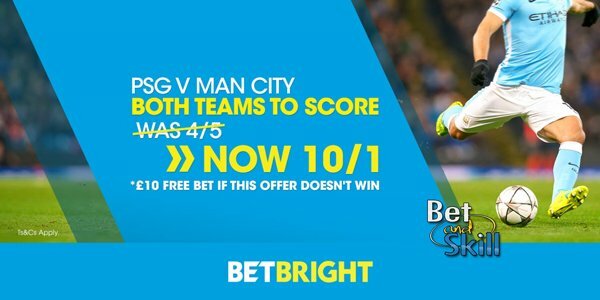 10/1 Both teams to score + £10 free bet! Get 3/1 Either team to win the match (Home/Away Double Chance)! Easy money! Price Boosts! 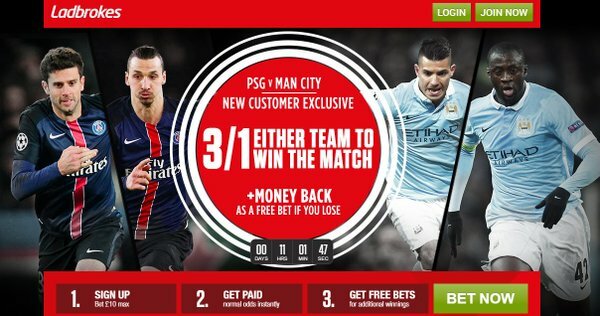 5/1 PSG or 15/1 Man City to win + £100 bonus! Risk-free! "PSG v Man City predictions, betting tips, lineups and odds (Champions League - 6.4.2016)"